Torrance Shipman is the new captain of her champion cheerleading squad. She has just discovered her previous captain, Big Red, stole all of their award-winning routines from another school. Now, she makes the decision to come up with something fresh and new to compete on their own merits so they can defend their title against the very school Big Red stole the championship cheers from in the first place. Mt. Carmel Sundevils represent! "Bring It On" is the feature film directorial debut of Peyton Reed, who would go on to direct movies like "The Break-Up," "Ant-Man," and most recently, of course, "Ant-Man and The Wasp." It is written by Jessica Bendinger, who would go on to write screenplays for movies like "First Daughter," and "Stick It." The film stars Kirsten Dunst as Torrance Shipman, a high school senior who has been voted captain of the Rancho Carne Toros, a five-time national champion cheerleading squad. When a new student and dancer named Missy (Eliza Dushku) transfers to Rancho Carne from a school in Los Angeles, she tells Torrance that the team's winning cheers were actually stolen by the team's previous captain, Big Red (Lindsay Sloane), from a cheer squad called the East Compton Clovers. Much to Torrance's horror, Missy is not lying, and after watching the Clovers perform their cheers, captain of their squad, Isis (Gabrielle Union), accosts them and tells them they need to bring it since the Clovers will be competing in the National Championships for the first time. Torrance refuses to do the stolen cheers, which leaves the Toros scrambling to create new and original routines in time for the competition. I might be a little biased because "Bring It On" was filmed in part at my high school, but this movie has always made me laugh and smile as long as I can remember. This comedy gives a loving but tongue-in-cheek look at the world of cheerleading competitions. At times, it makes fun of the stereotypes about all cheerleaders, and at other times, it turns these preconceived notions on their head in a smart but sincere way. Overall, the story is super simple and somewhat formulaic. An athletic team has a limited amount of time to master something difficult before a big competition. Much of this scenario leads to some awkward cringe-comedy where we feel embarrassed by what the characters have to endure, but remain completely entertained by it at the same time. Everyone in this movie is excellent, and they all play off of each other well. Kirsten Dunst and Gabrielle Union absolutely nail their respective team captain roles. Eliza Dushku brings a lot of smartass, sassy, sometimes backbiting humor to the table. Jesse Bradford offers the film's romantic aspects because of course there has to be a romance...it is a teen comedy from the early 2000's after all. This isn't your typical underdog narrative because the Toros aren't viewed as underdogs. The kids on the Toros come from wealthy families and live in an upper-class neighborhood. They are the defending champions and are the farthest thing from being underdogs. In any other more cliche movie, the team from the inner-city would be the focus of an underdog story. They just lack the financial means to be able to show off their cheerleading prowess. The Clovers are struggling to pay for their trip to Nationals, but the movie as a whole manages to avoid the typical "white savior narrative." The story should be commended for literally ripping this tired scenario in half. The dynamic of these two teams being competitors means there is no real villain in the story. The question then becomes, who does the audience root for: the protagonist, their redemption story, and their quest to make things right to prove that they can succeed on their own, or their competition, who want to show that it was them all along who deserved the championship all those years because they are vastly more talented. The movie covers this conflict in a well-rounded manner and offers a satisfying conclusion by the movie's end. 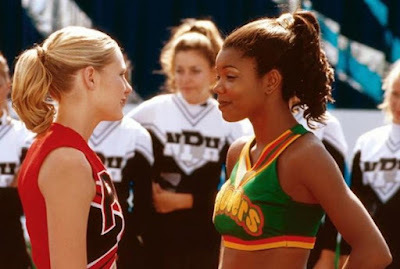 In the end, "Bring It On" is a simple, witty, light, fun story that is an entertaining and hilarious-but-very-dated watch. It balances sports, teen drama, and snarky humor perfectly. It remains one of my "childhood" favorites to this day.